Is Mubarak Really a Force of Stability? In the speech he gave in Cairo in June, President Barack Obama said, "I do have an unyielding belief that all people yearn for certain things: the ability to speak your mind and have a say in how you are governed; confidence in the rule of law and the equal administration of justice; government that is transparent and doesn't steal from the people; the freedom to live as you choose. Those are not just American ideas, they are human rights, and that is why we will support them everywhere." Obama linked the application of these ideas with stability and security. Then in August, during Egyptian President Hosni Mubarak's visit to Washington, Obama described Mubarak as a force of stability. As a man of courtesy, Obama may have just been trying to be a good host and show respect. It’s difficult to believe Obama is simply unaware of the Mubarak regime’s horrid human rights record or Egypt's poor-ranking international corruption reports. 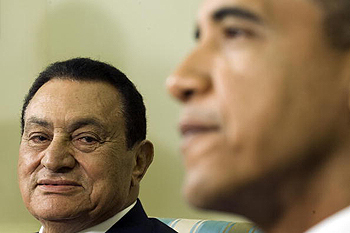 I hope that Obama is not just turning a blind eye to Mubarak's practices because he relies on him as an important ally in our troubled region—which is probably much nearer the mark. The praise Mubarak has received from the U.S. president illustrates America's double-standard politics that basically say: an important U.S. ally in the region, and a friend of Israel, is a force of stability, regardless of the regime's domestic policy. Mubarak is a force of instability and unrest. In Arab pop culture, the term korsi (chair) holds a political significance, referring to political rule or authority. In the Middle East, rulers get attached to this chair, and as time passes, the attachment gets stronger. Death, and only death, can put an end to this union, kind of like a Catholic marriage. This has become so much the norm that the term "ex-president" sounds very bizarre to the Arab ear. Consequently, access to power using legitimate means becomes unattainable, which is why political parties and groups resort to means that ultimately cause political turbulence and social unrest. In recent years, many political movements have challenged Mubarak's power, such as Kifaya, the Egyptian movement for change, and the April 6 Youth Movement. These movements organize protests, sit-ins and strikes that are usually crushed by riot police, leading to even more public dissent. A large number of students and activists have been detained and are being systematically harassed by the Egyptian police. In the 20th century, Egypt saw many attempts to challenge authority outside the system and the law. The country witnessed the assassination of many political figures. In 1990, Rifaat El Mahgoub, speaker of the Egyptian parliament, who was also a member of the ruling National Democratic Party, was assassinated in his car in Cairo by an Islamic group. Anwar Sadat, the Nobel Peace Prize winner and Egyptian president, was also killed by Islamic militant groups for signing a peace treaty with Israel. A few hours after his death, Asyut, one of Egypt's major southern cities, fell under the control of Islamic groups for a few days and tens of police officers were killed. For more than a decade after Sadat's death, Egypt suffered from a very strong wave of terrorism that claimed the lives of hundreds of civilians and police officers. Besides assassinations and terrorism, Egypt saw at least one military coup in 1952, a revolution in 1919, and a nationwide student uprising in 1936 where hundreds of protestors were killed by the police. Recently, civil disobedience has been commonplace, labor strikes are turning into some sort of a national sport, clashes between riot police and students are becoming standard to see on news programs, and deaths are reported daily during election time. The more that access to power is denied, the more people will look for alternatives and be willing to challenge power outside the system. When power is inaccessible by legitimate means, the ground is fertile for coups, revolutions, assassinations and non-peaceful methods of power transition. This is something Obama and his advisors seem to have failed to understand when they called Mubarak "a force of stability in the region." Moreover, trying to convince the public that presidents don't age or get sick like common humans has also been a widely used strategy in the Egyptian regime. In 2007, Ibrahim Eissa, editor of independent daily Al-Dostour, was sentenced to prison because he published an article questioning the then-79-year-old Mubarak's health. The court found him guilty of "publishing false information of a nature to disturb public order or security." Due to numerous protests and public dissent, President Mubarak pardoned Eissa after one of the most contentious court cases related to freedom of the press. After so long in the top seat, one would think Mubark's hunger for power would be sated. He has ruled Egypt for 28 years, not to mention his years as vice-president and a high-ranking military officer. Mubarak can make history by resigning the presidency and supervising free and fair elections to select a successor. As someone who is known to care for his legacy, gaining credit as the founder of democracy in the Arab world and ending the military's monopoly on power (and not by transferring it to his civilian son) should appeal to him. Mubarak can set an example in the region that democracy is attainable. He could possibly get credit for being the founder of democracy in the Middle East. Supporting Mubarak's regime might seem to the Obama administration like an easy way to keep the Arab world's most populous, and arguably most influential, country from turning into an Islamic regime, but in the long term, it will achieve the opposite. If the administration wants to help contain extremism and decrease support for groups that threaten the region's stability, such as the Muslim Brotherhood, it needs to work on making power more accessible by legitimate means.